CU CHI - Five Viet Cong took on three mechanical Americans eight miles north of here recently and didn't live to tell the tale. 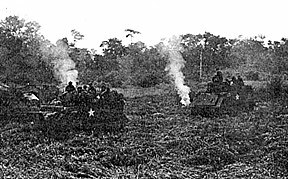 Elements of Alfa and Headquarters Companies 2nd Battalion (Mech), 22nd Infantry set up a series of armchair ambushes near suspected enemy dwelling places . In a variation on Wee Willie Keelers advice to baseball batters, the Triple Deucemen played "hit them where you ain't." When the mechanical devices detonated, the Americans were tucked safely in their night defensive positions. Alfa Company got three for two. Three VC tripped two separate charges in areas they had called home not too many days before. "We set them up in night defensive positions (NDPs) and in areas where we find enemy bunkers and tunnels," said Specialist 4 Rich Janway of Headquarters Company. "Many times the enemy has returned to these places and unsuspectingly hit the tripwire of a concealed claymore mine. Janway's buddies set their mechanical ambush inside one of their previous night defensive positions. As a result, the enemy, in his haste to scrounge through the trash the Americans left behind, tripped the mechanical trigger, losing two of his number. "Besides eliminating the enemy, we often find supplies he carried along with him," said Sergeant Henry Smith, a squad leader in Alfa Company." At one of the sites, we found two AK47s, 500 piasters and a notebook besides the dead VC." 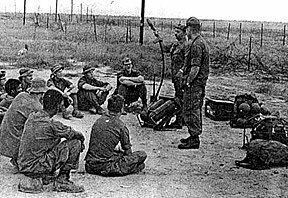 "One interesting thing is that these mechanicals were detonated shortly after sunset," said Specialist 4 Paul Lewis from New Cayuma, Calif.
CU CHI - A 25th Division soldier stubbed his toe one day recently. As much as it hurt him, it hurt the enemy even more. A Delta Company platoon, 4th Battalion, 9th Infantry was on a routine search mission in the Trapezoid area north of here moving through some brush, when suddenly one Manchu cried out in pain. "I had banged my big toe on something hard and sharp, and it hurt like hell " said Private First Class Stan Neveroski of Plainfield, N.J. The something turned out to be a wooden plank that jutted from an obscure underground bunker. A search of the bunker revealed one 60mm mortar and base plate, a hundred and one 60mm mortar rounds, fourteen cans of mortar charges and two boxes of mortar fuzes. Another search of the area uncovered more munitions-filled bunkers. Inside these, the men found thirteen 75mm recoilless rifle rounds, seventeen boxes of 75mm recoilless rifle fuzes, four Chicom claymores, four sub-machine guns, six hundred rounds of .60 caliber ammunition and one US 81mm mortar round. After evacuating the captured enemy weapons, platoon leader 1st Lieutenant Laurence Hunsaker had to laugh. "It's things like this that almost make you forget how much your toe hurts," he chuckled. CU CHI - Three Viet Cong fell victim recently to a 25th Division combination of 1st Wolfhound alertness and mechanical ambush power 16 miles north of here. In one action, elements of Alfa Company, 1st Battalion had just taken in their claymores and were preparing to move out. Suddenly, Sergeant Richard Guerra of Pleasonton Tex., spotted three VC about 300 yards away, headed toward the American position. Guerra alerted his men and they quickly set up an ambush. "They were walking directly toward us," said Private First Class Larry Sipes of Brownsville, Tex. "One had stopped to investigate something while the others moved to within 25 yards of us." The Alfa Company troops held their breath and their fire until the Viet Cong were almost close enough to touch, when they opened up with a barrage of small arms and machinegun fire spiced with a few hand grenades for good measure. The only enemy to escape was the wary fellow who had stopped down the path to investigate. "We figured they were probably a resupply team because of all the stuff they were packing," said Specialist 4 Alan Sterneau of Bellville, Ill.
"They had a number of plastic ponchos, a load of rice, several bottles of insect repellant and a few packs of cigarettes. Two days earlier, another Alfa Company element heard one of their mechanical ambushes explode as they were moving to their night defensive position. 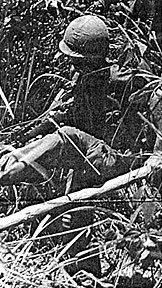 Later, after a sweep of the area, one enemy was found dead and several trails of blood were spotted where wounded Viet Cong had managed to stumble away. The Alfa Company Hounds captured one AR-47 and two wallets in the area. CU CHI - A Silver Star recently awarded here by Division Commander Major General Edward Bautz should have read, "His conspicuous gallantry reflects great credit upon himself, his unit, the United States Army - and his father." Recipient of the award, Sergeant Harry M. Beckwith III, son of Sergeant Major Harry M. Beckwith Jr., is NCOIC for the assistant chief of staff for personnel. The younger Beckwith received the award for action on April 6, 1970, while he was a tank commander with Alfa Troop, 3rd Squadron, 5th Cavalry. "His unit's night defensive position came under an intense attack by an enemy force employing small arms, automatic weapons and rocket propelled grenades," reads the award citation. "As he directed devastating suppressive fire with his .50 caliber machinegun, Sergeant Beckwith was severely wounded by a large piece of shrapnel from one of two rocket propelled grenades which impacted on his track. "Despite his severe injury, he refused to be evacuated and with total disregard for his wound and the intense hostile fire about him, he dismounted his vehicle and directed the evacuation of other wounded personnel." This is Beckwith's third tour in Vietnam. He first came over in March, 1968, and spent a year with the 43rd Signal Battalion. He returned to the states and, after retraining as a tank commander, returned to Vietnam and was assigned to the 3rd of the 5th Cav, 1st of the 5th Mechanized Infantry Division. "So you see," says his father who began his first tour in Vietnam in August, "I'm the rookie over here." The father is no rookie in the Army however. He completed his 24th year of active duty in February and "is beginning to think of making it a career." The younger Beckwith has decided to make the military his career as well. His father expressed a little disappointment at the fact that the young sergeant had not completed his education yet. Beckwith III says that he continues to volunteer for Vietnam duty because "I've got the experience that is needed out there." Sergeant Major Beckwith said that he doesn't get to see his son too often but that they have a very good relationship. "If there's any conflict at all " he said, "it's because my son is overly suspicious of me. He thinks I might try to pull some strings to get him a safe job. "He's bullheaded like his father. He wants to do everything on his own." CU CHI - Patience had its reward for men of the 25th Division's 4th Battalion, 9th Infantry, recently, as they bagged three enemy after days of waiting and hiding. "It was a perfect ambush," said Bravo Company platoon leader 1st Lieutenant William P Yonushonis. "We had stayed behind at our resupply point as the rest of the company moved out," said Yonushonis of Riverdale, N Y. "We were ready and waiting but it looked like nobody was going to come around. "On the fourth day, after the last chopper flew off, they (the enemy) finally showed up," Yonushonis added. Perfectly concealed, the Manchus waited until the enemy was within 20 yards before firing. To finish the action, artillery and gunships were called in. A sweep of the area later revealed three dead Communists, two AK47s, two magazines, two flashlights, some clothing and a smll packet of medical supplies. "I don't believe we could have been better prepared for it," said Staff Sergeant Dannie Justice of Macon Ga. "It was like out of a book and we came out without a scratch." For Yonushonis it was doubly satisfying because it was his first mission. BABY, IT'S COLD UP THERE...Then there's the story about the stork. The one that brings babies. Well, one evening recently nobody could find one of the large white birds, so they called a helicopter instead. Spec 4 Kieth Goble, a radio-telephone operator for the 1st of the 5th told the tale. 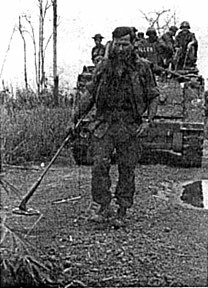 "We got a call about 8 p.m. for a dustoff at the village of Tan Phong," Goble recalled. "The guy said it was for a woman in labor." 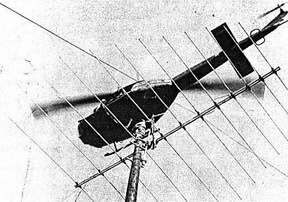 The urgent mission by a UH-1 (Huey) was pulled off without a hitch. Except the baby didn't wait until his mother reached the hospital before making his grand entrance. Yessir, there he was at 2,000 feet. Goble suggested an appropriate name. "Baby Huey, of course." GET A RE-UP BONUS WITHOUT RE-UPPING...Yup. This is a chance we've all been waiting for. USARPAC has announced a command-wide reenlistment poster contest which will award 15 winners a total of $675 in United States Savings Bonds. The deadline for the contest is November 30 and all soldiers are eligible except for those whose primary duty is recruiting or reenlistment in the command. Artistic talent is not necessary. Just slap an idea on a piece of poster board or plain white paper not smaller than eight and a half by eleven inches. You can enter as many times as you please. Winners will be awarded $100, $50 or $25 bonds. They will be selected and notified by December 15. THE ARMY'S JUST NOT THE SAME ANYMORE...Sigh. Look around at your fellow soldier, troop. He is one of the last of a dying breed. He-and you-went through basic training when it was really tough. I mean with the 150 yard man carry and the 40 yard low crawl and everything. Word has just been leaked by DA that these two brutal tests of soldier stamina have been replaced by simple old push-ups and sit-ups. No more will drill sergeants order recruits to low-crawl from the mess hall back to the barracks for exercise. They'll make them do sit-ups. And sit-ups won't get them back to the barracks unless they do them differently than I did. No, it's just not the same Army anymore. PLANT YOUR MONEY IN THE USSDP...And it will grow. If you were to deposit a million dollars in the Uniformed Services Savings Deposit Program and leave it there for a year, you would make a cool $100,000. That's the 10 per cent interest the program pays annually. Unfortunately you can't deposit a million dollars unless you make a million dollars. And not too many people have cranked out a million bucks from the green machine. But you can deposit a sum equal to your paycheck every month. And whatever you put in will increase by 10 per cent in a year's time. You can withdraw your money from the program for R & R, regular seven day leave, emergency leave or special leave. You can also withdraw money for emergencies of a personal nature. DAU TIENG - Cowboys and Indians, yes . But, Cowboys and Vietnamese? A medical civic action program (MEDCAP) conducted by 2nd Battalion, 14th Infantry here recently, turned into a western rodeo show for the local villagers. And judging from the Vietnamese reaction, cowboys and calf-roping seem to have world-wide appeal. The Golden Dragon's cattle rangler is Staff Sergeant Leo Preszler of Meadow Lake, S.D. "I worked on a ranch back in the world," Preszler said, "and brought my ropes to Vietnam to keep in practice. My buddies on the MEDCAP team suggested I put on a show for the kids." With a calf constructed from ammo boxes and sandbag material, the group hit the dusty trail to demonstrate how the American west was won. Once in the village, a crowd of small children and adults gathered to watch. They began to laugh, then cheer as Preszler displayed his method of rounding up stray livestock. "The kids were shy at first," Preszler said. "But one boy finally came forward to try his luck. After three attempts, he got it." Soon, everyone was trying their hand at calf-roping. After a brief fact-finding tour of the village, Master Sergeant John Wright, civic actions NCOIC said "the food we gave them was already on the stove." Well, after all, cowboys do work up hardy appetites. XUAN LOC - The combat doctor in Vietnam is very similar to a general practitioner in the States. He treats a wide variety of ills and pains and gets to know his patients pretty well. This is the opinion of a 25th Division doctor, a combat veteran with the 3rd Battalion 22nd Infantry. "Being a combat medic, you get to know people on a more personal basis," said Captain Steven Widlansky of Keekuk, lowa. "And a doctor tends to become more emotionally involved when someone gets hurt, feeling a sense of responsibility to the wounded individual. " The military M.D. holds the infantryman in the highest regard. "The grunt far and away has the toughest job there is in the Army," Widlansky said. "They manage to stand up amazingly well though under the strain of combat and environmental conditions "
Widlansky noted obvious differences between combat-associated versus more common-type maladies. "Naturally GI illnesses differ in most respects from ailments you would expect to treat back in the world. Shrapnel and bullet wounds are a part of the occupational hazard and more common than other types of injury." Even in a war zone, there manages to shine through a little bit of light-heartedness even in the grimmest of circumstances. "The GI has a propensity to contact certain social diseases no matter where he is " continued Widlansky. "I've had to use more penecillin in the last six months here in Vietnam than I did in three years back in the States. And it wasn't for colds either! " Of the combat medic so often in the field, Widlansky was enthusiastic in his praise. "Medics are fine young men," said the Army physician. "I find that they earn more than their share of Silver Stars and other awards." Some hardships are expected while serving the grunt in the field. "Trying to practice medicine of a reasonably high caliber with limited facilities is the biggest problem we face every day," the doctor observed. Rewards to the doctor in the field probably include nothing more than a grateful, "Thanks, Doc," from most of the men. However, there are times when unusual gifts are offered in exchange for his services. "During our Cambodian MEDCAPs we had given out all of the medicines we had and in return, the villagers we treated gave us a whole cartload of fresh pineapples," Widlansky recalled with a smile. FSB BYRD - Hot buttered popcorn in Vietnam? Well, maybe at a big basecamp where the facilities to pop it are available. But certainly not at a fire support base out in the boonies. Guess again. Not only do they pop the stuff at Fire Support Base Byrd, but business is thriving. Artillerymen from Bravo Battery, 7th Battalion, 11th Field Artillery have found the means to turn out hot buttered popcorn that may very well rival the product we've all learned to love down at the local movie house. In fact, it might even be better. The recipe is simple and the equipment not hard to come by. One's friendly neighborhood mess hall is a main supplier for the popper (a one gallon can), salt, butter and cooking oil. The corn comes in care packages from home and the heat is supplied by anything that burns. The can, after small modifications, is lightly oiled and the corn is poured in. Heat is applied and in five minutes, one has a gallon of hot popcorn. The butter, meanwhile, is melted down in a beer can. Though most of us would rather have the real thing down at the Bijou during a Saturday night movie, the Redlegs at Byrd aren't complaining. One gunner registered the feelings of all. "What can I say, man? War is Hell." Pages 4 and 5 contain a photo spread of the Dustoff of a sick Vietnamese village woman to the hospital in Cu Chi. The photos were too dark to scan well, and I was missing page 5, so the pages are omitted. DEAR SARGE: Yesterday, I was prevented from entering the PX by the courtesy guard at the doorway. He said my boots weren't bloused. Sarge, I had just returned from 27 days in the field. I had only been at a fire support base twice to resupply. My uniform was ragged and my blousing rubbers had been eaten by fungus, moisture and eventually by our pet python. I was, in fact, going into the PX to buy some new blousing rubbers when I was stopped by the guard. When I tried to explain this to him, he called an MP and I was charged with disrespect to a senior NCO. I am now in LBJ serving 60 days at hard labor. They don't issue blousing rubbers here either. They're afraid we'll strangle ourselves. How am I supposed to get out of this mess? DEAR BELL: Fear not. When you are released from LBJ (fiscal 1972) you will be given a complete new clothing issue-including new blousing rubbers. You 're in luck. DEAR SGT CERTAIN: In the last issue of the TLN, I saw a picture of a Hollywood starlet who used to live just down the block from me in Parma Heights, Ohio. She was cute then but when she moved west, I never dreamed she would become a starlet. I first met her in a swimming pool, saving her honor by splashing water on some ruffians who were trying to start the braless fad before it was fashionable. I even dated her a couple of times, but none of the guys in my unit believes me. Is there any way I can contact her through the TLN? I would like to tell her how Parma Heights has tripled in size since 1960. It is now the 168th largest township in Ohio. DEAR LOTION: Well, I can only suggest what the TLN's production supervisor recommended. Send us an 8xl0 glossy of yourself in the buff and we'll try to sneak it into our next issue. Since we have distribution points in Hollywood, your starlet friend may recognize you and write. Come on, Sonny. Did you really date her? DAU TIENG - "On a Clear Day You Can See Forever," is the title of a hit Broadway musical and song. For a select number of 25th Division artillery unit observers, these words have a lot of meaning. Rising from the center of the 1st Brigade's base camp here, is a needle-like structure that provides a commanding view of the installation and surrounding countryside. The tower is manned 24 hours a day by members of the survey and radar sections of the 7th Battalion, 11th Artillery. It provides a means of quickly identifying the locations of enemy rocket and mortar emplacements during an attack. Because of its height (110 feet), the tower provides excellent visibility. In the tower is a switch which starts a siren wailing at any indication of incoming. A radio and landline phone connects the tower with the arty's tactical operations center (TOC). Specialist 4 Gene Gagner, a surveyor from Superior, Wis. describes his job this way- "Our purpose actually is to get an azimuth on the origin of the enemy incoming rounds and to adjust fire for the arty once they start shooting back." In order to get an azimuth Gagner is equipped with an artillery aiming circle. When he sights the flash of an enemy mortar, it's only seconds before he is calling in the direction and estimated range to TOC. "The worst part of the job, of course, is when there is incoming," said Gagner. "We sit up here and can see everything, like where the rounds land and guys running around. Its kind of pitiful and there's nothing we can do about it." "Its sort of a nice place to get away from it all," Gagner remarked. "The mosquitoes don't bother you and even the birds don't fly this high." The daily climb is a mini-PT session. 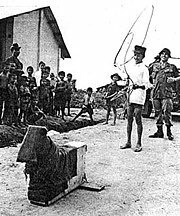 CU CHI - It was just like any other day at the 25th Division base camp. The men of the orderly room of Alfa Company, 4th Battalion, 9th Infantry, were performing their routine early morning sweep of the company area. The enemy was sighted slithering through the grass. 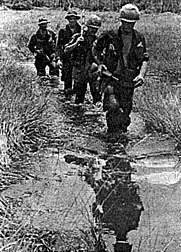 Recalling their lessons in basic training, and recognizing that unmistakable low crawl, the men immediately established the enemy's identity - a three-foot long cobra. The reptile, realizing his position had been discovered, quickly evaded to the southeast, finding cover and concealment beneath the floorboards of the company's orderly room. Without a moment's hesitation, Specialist 4 John R. Colson of Kansas City, Mo., and Sergeant Thomas R. Konen of Hilgert, Wis., initiated the aillied attack by hurling several smoke grenades into the enemy hideout. Producing negative results, the second phase of the attack was started by removing the floorboards in one corner of the orderly room. Although this action uncovered the nest of the enemy's organization, only trails were left as evidence of his activity. The final allied tactic, pouring 1,200 gallons of water down the holes, also failed to flush out the enemy. "Although we were unable to establish a single cobra body count," Colson said, "we now have conclusive evidence that there is an extensive tunnel complex under the orderly room - at least 1,200 gallons worth." CU CHI - The 25th Division's area of operations north of here contains many hazard-filled hedgerows. To help make the task of exploring them safer special classes concerning bangalore torpedoes and flame throwers have recently been conducted for members of the 2nd Battalion, 27th Infantry. "Considerable time would be lost trying to maneuver around every hedgerow we come to," said Private First Class Victor Salinas of McAllen, Tex. "The flame thrower and bangalore torpedo are about the fastest and best ways of getting through suspected booby-trapped hedgerows." At the bangalore classes one mile south of Fire Support Base Snyder, the Wolfhounds watched instructors blow gaping holes in a hedgerow. Later, to demonstrate its effectiveness, the men practiced on a few hedgerows themselves. "Proper use of the bangalore would eliminate any hazards of going through a hedgerow," said Private First Class Donald Slattery of Bloomington, Minn. The next day, 2nd Houndsmen attended flame throwing classes. They thickened fuel, pressurized tanks, and fired the flame throwers. '"Using the flame thrower to cook off booby traps and burn up thick brush for better visibility before entering a hedgerow is extremely advantageous in the area were working in," Private First Class Alfred Oresco of Austin, Tex. explained, "and with the addition of flame throwers and bangalore torpedoes in the field more area can be covered safely." 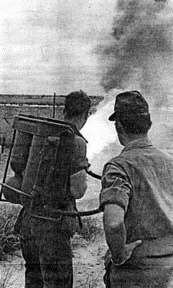 HOT STUFF - (Above, left) PFC Gary Stewart fires his flame thrower as Master Sergeant Harley Gill observes his firing techniques. SAFETY FIRST - (Above, right) Sergeant First Class William Mann explains safe handling procedures to the 2nd Wolfhounds before firing of flame throwers. GET DOWN! 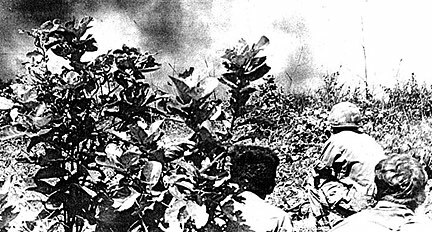 - Members of the 25th Division's 2nd Battalion, 27th Infantry stay low as bangalore torpedoes rip away a hedgerow south of Fire Support Base Snyder. The demonstartion is part of a class conducted by the battalion to familiarize troops with hedgerow destruction. How Does Charlie Use It? CU CHI - "Comrade men, please to pass the Tropic Lightning News." Because of the lack of well-written and timely reading material in his own language, the enemy has apparently switched from the old run-of-the-Communist mill propaganda to the 25th Division's Tropic Lightning News. 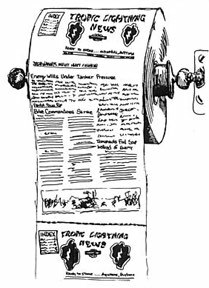 On a recent operation southeast of the Boi Loi Woods, men of the 2nd Battalion, 27th Infantry's Delta Company discovered a large cache which included 20 copies of the division's newspaper. ''While we were securing a thickly-boobytrapped area, we spotted several bunkers," said 1st Lieutenant Peter Paul, a platoon leader from Lantana, Fla. The next morning his men were sent in with demolition equipment to blow all the bunkers in the area. "I was moving down a small path checking for trip wires when I came across a little crawl trail," Paul continued. After checking out the area, the men found a large bunker with a tunnel, fighting position and cooking position, all harboring parts of a supplies cache. Evacuated were 50 smoke fuzes, assorted cooking utensils, 170 rounds of small arms ammunition and the periodicals. Left in place to be destroyed, were two 82mm mortar rounds, one 60mm mortar round, two claymore mines and several booby-traps. No one knows exactly what Charlie planned to do with the Tropic Lightning News. He might have planned to use it for...no, he couldn't have...not that. CU CHI -- Providing entertainment for the enemy doesn't sound like SOP for a 25th Division combat unit in Vietnam. Yet, that was what the men of Bravo Company, 2nd Battalion (Mech) 22nd Infantry, were doing recently while working in the northern Filhol near here. During a routine operation the Bravo Regulars uncovered a freshly dug bunker which had a note pinned to the entrance. With the aid of a Kit Carson scout, the note was translated and found to be an urgent appeal to VC sympathizers for food, water and medical supplies. Contacting the 6th PSYOPS Battalion located at Bien Hoa, Triple Deuce put together an answer to the note that the enemy would long remember. 'The circumstances surrounding the note provided an excellent opportunity for us to put some of our techniques into practice," said Specialist 4 Frank De Long, a member of the PSYOPS team, from Brainard, Minn. Using the company's Kit Carson scouts and tapes, an evening of entertainment was concocted for Charlie that rivals spectaculars back in the world. Included in the program were popular NVA and VC songs, monologues and fireworks displays. The program came to be known as "An evening with Triple Deuce and Friends" or "Hang it up Charlie, you are surrounded." After receiving a rating of "G" from the Program Selection Board, which meant it was fine for general audiences, the program was ready to go. It would be broadcast from the Bravo Company night defensive positions. On opening night the show started with a modern song "Wandering Soul." It depicts the ancient Vietnamese belief that if one loses an arm or leg and dies, the soul comes back looking for the lost appendage. It's a little way out, but very modern. Next came the ever popular "Little NVA Sister" or "The Crying Baby." It was aimed at the more sentimental in the audience. Here, home and family relationships are stressed as a young girl pleads with her soldier brother to come home. Appropriately placed throughout the program were talks by Kit Carson scouts telling of the improved life for those who rallied to the South Vietnamese government. As in all really great performances, the end is marked with a grand finale. The Triple Deuce Regulars had also saved the best for last. Having coordinated with artillery batteries and mortar sections, the number one song in North Vietnam, "Night Brings Death" was played as barrages of artillery and mortar fire went slamming into suspected enemy positions. "I haven't seen fireworks like that since last New Years Eve," said Specialist 4 John Nowak from Detroit. Currently the show is in its third night. It has been held over by popular demand. Although not that of the enemy. He was mysteriously unavailable for comment. Obviously he had been so impressed that he was out telling all his friends. As for the men of Bravo Company, they might have been a little disappointed in this lack of response. CU CHI - "Khong, no se Dau." (No, it will hurt.) 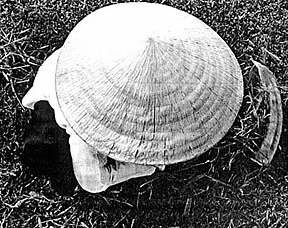 With these few words, 14-year old Huynh Van Thang, from one of the small hamlets near here refused admission to 3rd Field Hospital, Saigon, for an orthopedic operation. However, Thang's action was an exception to the general success of a unique program of the 25th Infantry Division's 25th Medical Battalion. The two part program, dealing with amputees, cleft lips and palates, was started and is administered by the medical battalion's medcap team. The prosthetics (surgical replacement of missing parts with artificial structures) part of the program is generally being handled by Saigon's National Rehabilitation Institute, an offshoot of the USAID-supported World Rehabilitation Fund. Prosthetics patients are picked up by the MEDCAP team on their circuit around Cu Chi, and taken to the division dispensary for a general examination. After a brief stay in the wards, they are then taken to Saigon by Specialist 4 Gray Reed, MEDCAP coordinator for the program. "The program is starting to move smoothly now," said Reed of Detroit, who schedules the patients and provides transportation to and from Saigon for them. "The MACV teams in the area are very interested, and they are bringing in patients too." "Another important function of the Institute," adds MEDCAP member Specialist 4 Donald Johnson of Kersham, S.C., "is their vocational and psychological evaluation and counseling program leading to job placement for these special people." Besides the National Rehabilitation Institute two other institutions are involved in the MEDCAP program: the US Army's 3rd Field Hospital in Saigon, and the Barsky Unit of the civilian Cho-Ray Hospital, also in Saigon. "The program has been in operation several months now and approximately 30 people have been treated," said Sergeant First Class LeRoy Williams, operations sergeant for the medical battalions psychological operations office. Another phase of the program is now in progress as the medics are starting to send both prosthetics patients and those with congenital labial abnormalities to the Barsky Unit. This center for plastic and reconstructive surgery sponsored by Children's Medical Relief International, is administered by a 60-man Vietnamese and rotating international staff. The Barsky Unit surgeons, pediatricians, and allied health personnel provide patients from three months to under 21 years of age with free medical treatment. "The Barsky clinic," said Specialist 4 Larry Heileman of Middlebury, Conn., a member of the MEDCAP team, "is a permanent semi-Vietnamese establishment that is set up and staffed especially for the type of patient we bring to them." "And there are more programs to come" said MEDCAP NCOIC Specialist 6 David Hopkins of Granite City, Ill. "Work is now being done on an eye program for cataract, glaucoma and cross-eyed patients." The MEDCAP team will undoubtedly run into more patients like Thang, a child away from his parents and hamlet for the first time, and scared of a place as foreign and formidable as a Saigon hospital.